Bull thistle is a moderately large wildflower measuring approximately 60-180 cm. in height. It is most easily recognized by its spine-covered fruit and bright pink or white flower cluster positioned atop the terminal shoot. The spiny-winged stem and long leaves are robust and are covered densely with sharp spines. Like most composite flowers of the aster family, the radially symmetrical bull thistle bloom is comprised of numerous, long, rayless, pink or white flowers. The flower cluster, measuring approximately 4-5 cm. in width, rests atop a large, round structure comprised of spiny, green and black, yellow-tipped bracts. The seed-like fruit, measuring 5 mm. in length, is elongated and tipped with numerous, wind-catching, bristles. Bull thistle grows best along roadsides, in pastures, and around waste areas. 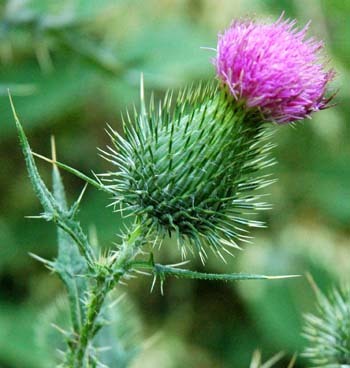 Bull thistle is a very dangerous plant. The sharp spines that cover virtually every surface of the stem, leaves and flower head can easily puncture and irritate skin. 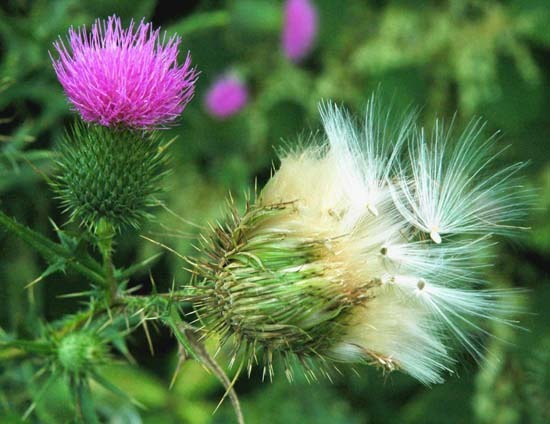 The bristles found on the fruit of the bull thistle are appropriately named "thistledown". These bristles are sensitive to wind and allow for wide dispersal of the bull thistle fruit.